Inspire | The Secretan Center, Inc. So effective are the ideas in Inspire: What Great Leaders Do, that 15 CEOs and leaders wrote the forward in which they describe the remarkable transformations that happened to their organizations and personal lives when they adopted them. Most models of leadership are grounded in primitive concepts such as Pavlovian psychology and behavioral science methodology. These theories have their roots in turn-of-the-century thinking based on the concept of rewarding behavior we wish repeated, and punishing behavior we wish discontinued. Thus we become experts in motivation—a fear-based approach. But great leaders do not motivate, they inspire—an approach that emanates from a loving, serving heart. Another fundamental flaw in this thinking is the belief that inspiration can be managed, that it is a “technique”. In truth, inspiration comes from a much deeper place—it comes from the soul. Inspiration is the experience we are all yearning for – at home and at work—and this is what Inspire! What Great Leaders Do is all about. We are living in times when people are yearning to be inspired. Many organizations, teams, and families operate from a fear-based culture. But when we are afraid, we cannot inspire, nor can we be inspired. Removing fear is the first step to creating the conditions for personal and organizational inspiration that lead to greatness. Inspire! describes a widely used and highly successful process for overcoming our fears and re-framing our thinking that causes all of our interactions—at home and at work—to be inspiring. 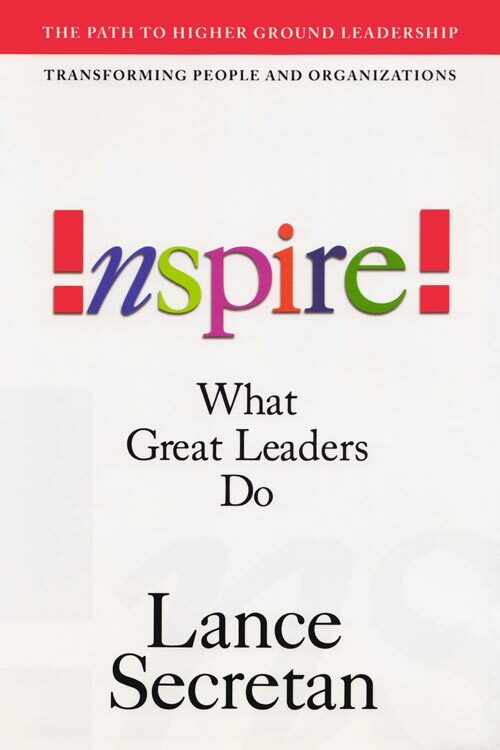 Dr. Lance Secretan has dedicated his entire life to the study of leadership. He has researched the biographies of more than 100 of the most inspiring and successful people in history, as well as contemporary leaders from many fields. He has helped six companies to be named to Fortune’s Best Companies to Work For in America list, and eight others on this list are also his clients, and 30 more are on Fortune’s Most Admired Companies list. From this research, practical application, and first-hand observation, he has developed a set of concepts and theories about how to become inspired, and how to inspire others. He calls this work Higher Ground Leadership®.